Between November 1937 and July 1938, London Transport took delivery of one hundred and fifty H1 class trolleybuses; they were numbered 755 - 904. On Leyland chassis with MCCW bodywork, seating was for seventy. One of the vehicles was 796 which entered service at Holloway depot in March 1938 - its tenure was short for in the summer of 1939, along with many other H1s, it was sent to Bexleyheath depot where its higher capacity was better suited than the sixty-seaters operating in the area. The reason for this was that the services operated out of Bexleyheath depot served Woolwich Arsenal which was involved in war work. Bexleyheath depot suffered two air attacks during the war; the second one on the 29th June 1944 saw 796 badly damaged. 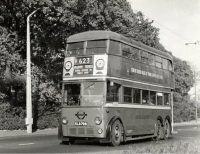 An assessment deemed it worthy of repair and she continued to operate from there until 3rd March 1959, the last day that trolleybuses operated on route 696 and 698. 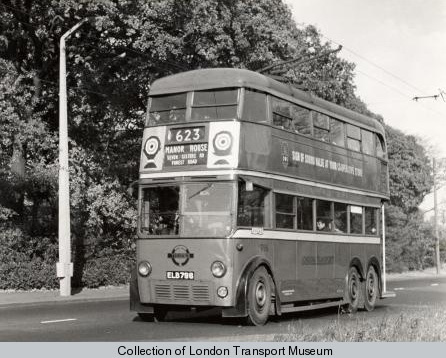 This was the first stage of London Transport's trolleybus to motor bus changeover. 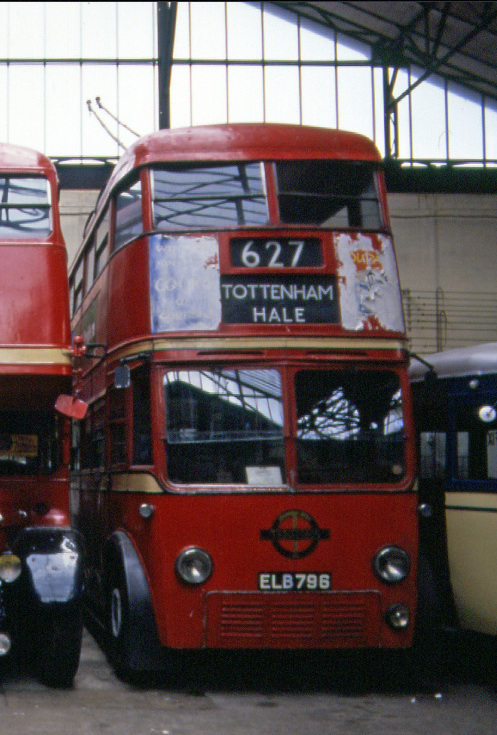 Policy dictated that older vehicles would go for scrap first - this meant that eight of Bexley's H1 were transferred to Walthamstow depot where they replaced eight C3s; on 5th March, 796 was towed to this East London depot. It was the intention to withdraw 796 at stage five, but fate intervened in the form of the Paris Transport Museum [AMTUIR] whose president approached London Transport and asked if they would be prepared to donate a trolleybus to them. The response was in the affirmative and having already put aside AEC 260, AMTUIR were to receive a Leyland. The Walthamstow foreman was asked to select a vehicle in good condition. He chose 796 which, to save it coming to any harm, was withdrawn at stage four of the conversion programme. Its last day in service was Tuesday 10th November 1959. It was stored in the depot until late January 1960, when it was driven on trade plates to Edmonton depot. Sometime during 1960, AMTUIR's president inspected 796 and was very satisfied with the choice of vehicle. Whilst in Edmonton depot he noticed that trolleybuses were showing EDMONTON TRAMWAY AVENUE on their destination blinds and asked London Transport if 796 could be fitted with blinds from that depot so that this display could be displayed - this was agreed to. Arrangements were made for 796 to travel to France and it was towed to Dover by London Transport service vehicle 401W on 7th October. 796 was placed on a boat on Saturday 8th October 1960, arriving at Dunkirk later that day. It was towed to AMTUIR's museum at Malakoff. 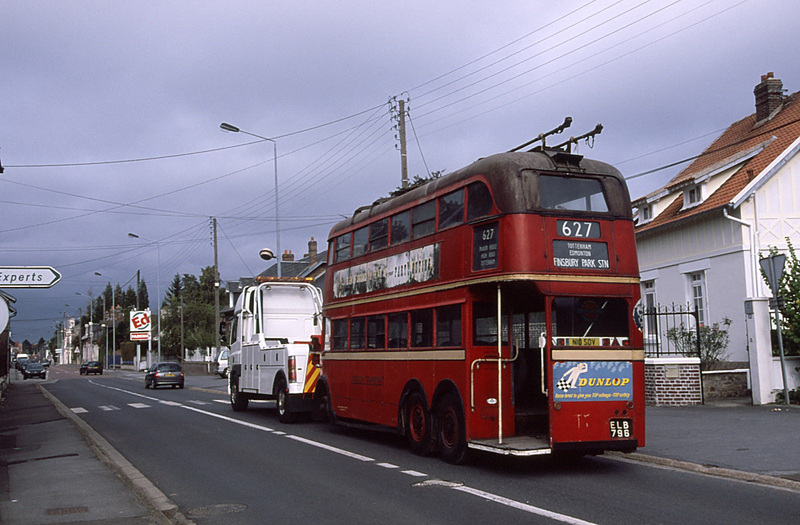 Over the years AMTUIR moved premises and in the spring of 2008 it came to the attention of Hugh Taylor, a member of the London Trolleybus Preservation Society, that 796 was not on public display - it should be noted that 796 has always been kept undercover. An approach was made to AMTUIR asking if they were prepared to put 796 on a ten year loan agreement to the LTPS, whose operating premises are at the East Anglia Transport Museum at Carlton Colville, Lowestoft. Some AMTUIR officials attended a trolleybus weekend there in September 2008 and liked what they saw; it was verbally agreed at the time that 796 should return to England. Three members of the LTPS inspected 796 in France in March 2009 - it was found to be very sound, thus vindicating the opinion of the Walthamstow foreman, back in 1959. In November 2009, AMTUIR formally agreed to send 796 back to its homeland and the loan agreement took effect from 23rd July 2010 - it can be renewed every ten years. In early October 2010, three members of the LTPS travelled to France and prepared 796 for its return to England. The half shafts were removed and replacement wheels and tyres fitted. Neil Yates Recovery of Snodland, Kent carried out the tow which they did very efficiently. 796 left its hidey-hole and was towed to Calais where a search of the cab and saloon failed to produce any illegal immigrants! 796 touched down on British soil at 8.10pm on 5th October 2010 - she had been away for 49 years and 362 days. Arrival at Carlton Colville was just before 1pm on 6th October; later in the afternoon its front valance was put on and the trolley arms lifted on to the unelectrified wires. Later on she was placed in the depot. Now the job of restoration is to take place and visitors to this site will be kept updated. You may also use the and a response will be made to all who use it. If you have any pictures of 796 in service they could be added to this page.